With New Year just around the corner, keeping fit or getting fit is a thought on many people's minds. We all want to look and feel our best of course! So with 2019 on the horizon and the gym calling our name, check out these sleek, stylish and totally sophisticated gym and workout outfits which I have selected and pieced together exclusively from PrettyLittleThing.com. I am bringing you the workout clothes of your dreams that will make you want to hit the gym, go for that run and start that dance class, all in tip top style! I have always loved stylish workout clothes, as they make you feel good when working out but are also a comfortable wardrobe staple on days where you feel like rocking a casual, yet oh so sporty look. A matching set when worn together looks stylised and well put together, yet individual pieces can also be effortlessly mixed and matched accordingly to create any look you like as they're interchangeable and the colours of these pieces I have selected compliment one another perfectly. 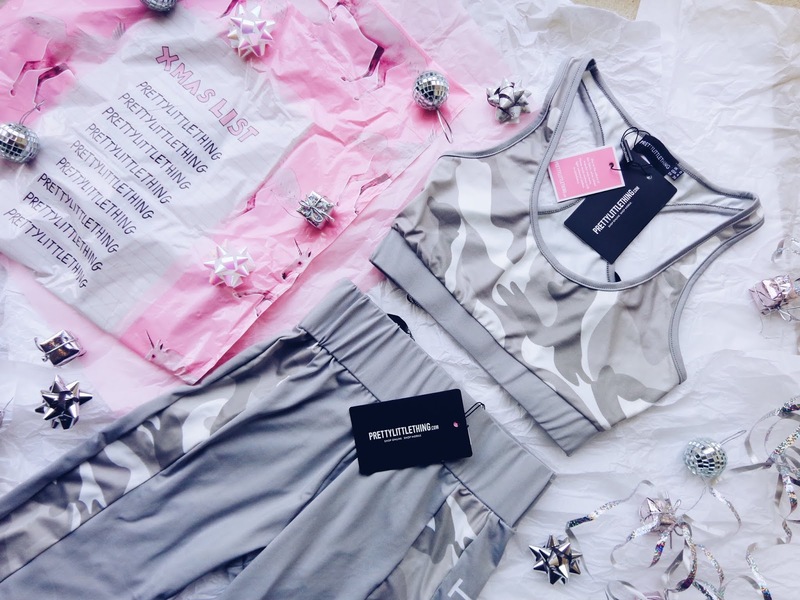 So grab a cup of tea and get your wish list poised at the ready, as I've got a helping of 'gym-spo' clothing for you, that your wardrobe will love for the New Year. When I spotted this workout co-ord online, I knew it was a yes from me. From the unique contour pattern on the legs, to the bold PrettyLittleThing waistband and the stylised top with PLT SPORT written on it and with a stylish cross-body back, it is just one of the chicest gym outfits I've seen going. Paired with black trainers with a white sole (you know the drill), it's a gym must-have for me. If you go jogging and won't be deterred by the cold, then girl you need this PLT hoodie in your life. I love the branded hem design and how it also has a hood as Winter is cold but workouts can't be put on hold until it's summer again (because that would be May time!). It is also a cropped length which means the high waistline of the leggings can still be seen - important as this is a key style statement of the workout attire here! The raw edge adds some attitude and a sporty vibe that elevates any gym look instantly. It's in a beautiful warm chocolate brown shade which works well with all the other garments I've picked too. I don't usually find many clothes that are in this colour and I don't know why because it's such a warm and cosy shade what compliments most other colours. Needless to say, I love this hoodie and will be sporting it often in 2019! A classic pattern with a modern twist. This Grey Camo gym set with leggings and a crop top can be bought individually if you want one part of it or if you love to be 'matchy matchy' then as a set they're super sleek and stylish too, with 'PLT SPORT' written down the leg and in a dreamy variety of grey tones. A girl can never have too many pairs of gym leggings, can she? These blue leggings are petrol effect meaning they have a shine that looks like petrol on water when worn. They're in a gorgeous shade of deep sky blue which is what initially drew me to them too. This set caught my eye as the panelling down the leggings is so unique, splitting it into black and white 50/50 style. Also, the 'PLT SPORT' writing emblazoned down the side looks sporty and sophisticated with an edge. This set also matches black and white trainers like a dream! Workout clothes goals 100%! A pop of colour is always a good idea in my books. Interchangeable with any gym top, I opted to mix n match it with the PLT Khaki Sport Crop Top as the earthy green worked well with the red contrast. The slogan banded ankles and waistband add a unique style statement and a pop of attitude. This is offset by the delicate black net triangular panelling on the hips, a subtle yet sophisticated feature. This blog post is written in collaboration with PrettyLittleThing. All opinions remain my own. Hey Bilgi! I loved stylish workout clothes, as they make me feel good when working out but are also a comfortable wardrobe staple on days where I feel like rocking a casual. But If you want Bras Sets for occasionally wear then katysboutique will be the right choice for you because of multiple variety products.